During the last of the twenties some of the ranchers who had obtained land from the Kinkaid Act sold their holdings. This tended to reduce the number of people in the county, and by 1930 there were 1358 people in the county. This was a reduction of 334 people from 1920. The years, 1920-1930, as a whole were good years for the county. Businesses and people lived well and prospered. This was in sharp contrast to what the thirties would bring. The events of the 1930’s began in 1931 when Paul Bender bought the Platt Mercantile Company from the Platte Brothers, Sheriff D.V. Platte resigned and was replaced by R.C. Ready, the Tryon Garage was sold to O.J. “Punk” Warren, and a fairly good graded road was completed between Tryon and North Platte. 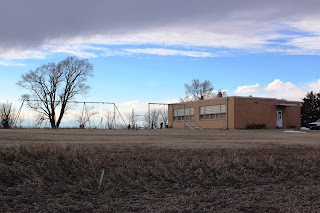 Also in 1931 the Mathers Chevrolet Garage was reconverted to be a gymnasium for the high school. Previous to this time the I.O.O.F. Hall and other buildings had been used by the high school. The well-known depression of the thirties also began in 1931. It began approximately in September of 1931 and didn’t start to let up until about 1939. 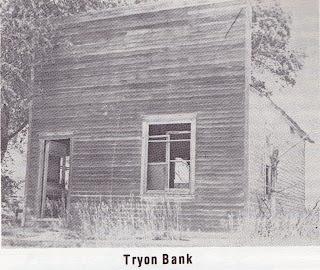 The first blow of the depression proved too much for the Tryon Bank and it closed in January of 1932. It was closed for only five months, though, and reopened on June 2, 1932. The year 1933 was probably the most tragic that this county has ever witnessed. 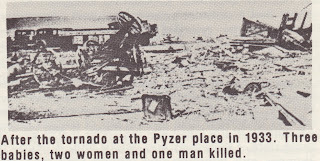 On May 22, 1933, a tornado swept across the county. It began at a place a short distance from the county’s south border, traveled north, passed east of Tryon, and ended at the Dismal River. 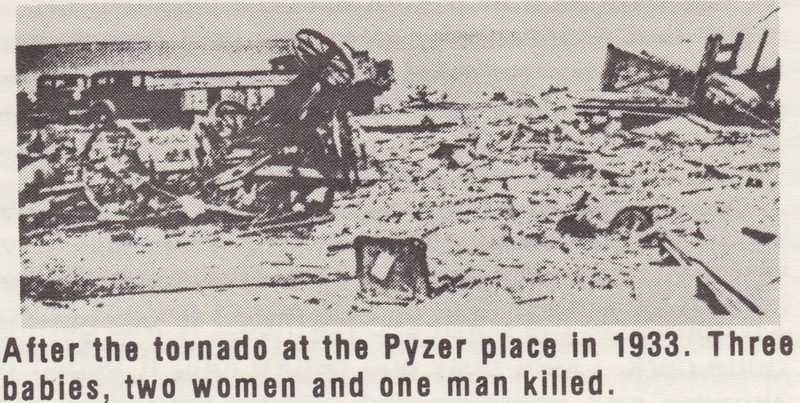 It destroyed several buildings and the following people were killed by this tornado: Dora and Iola Pyzer, Mary Pyzer, Edna Nelson, Willis and Donnie Bender, Mary and Lizzie McIntyre. The high winds which accompanied the storm were responsible for the deaths of Marvin Cullinan and Ollie Waits in other parts of the county. 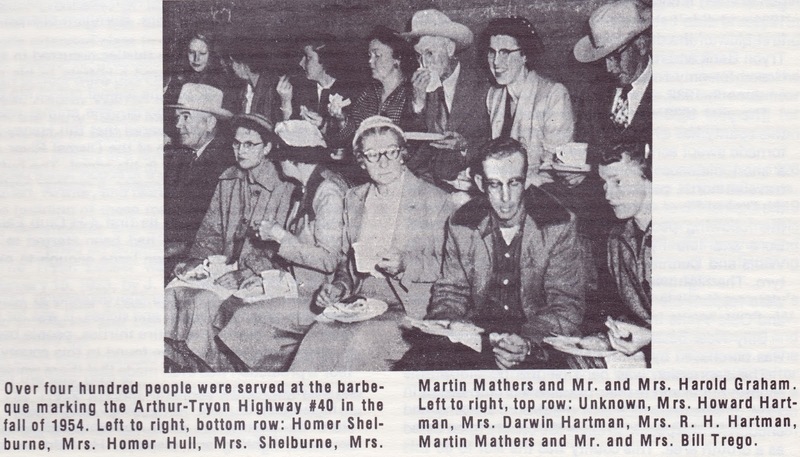 Billy Neal became Sheriff and the Tryon Garage was purchased by J.C. Heldenbrand also in 1933. The depression was hard on the people of this county, but to add to their troubles a drought began in 1934. It was not until 1936 that the drought became bad enough for the people to allow the county to be listed as a drought area. This county was the last to do this in the state of Nebraska. Although the drought was not as severe here as in other parts of the state, it caused great hardships to the ranchers of the county. The ranchers obtained government feed loans and also obtained loans from the Birdwood National Farm Loan Association and the North Platte Production Credit Association. The government bought approximately 3,855 head of cattle in this county in 1934 at an average price of fifteen dollars per head. If it had not done this it is doubtful if the ranchers could have obtained anything for their livestock. 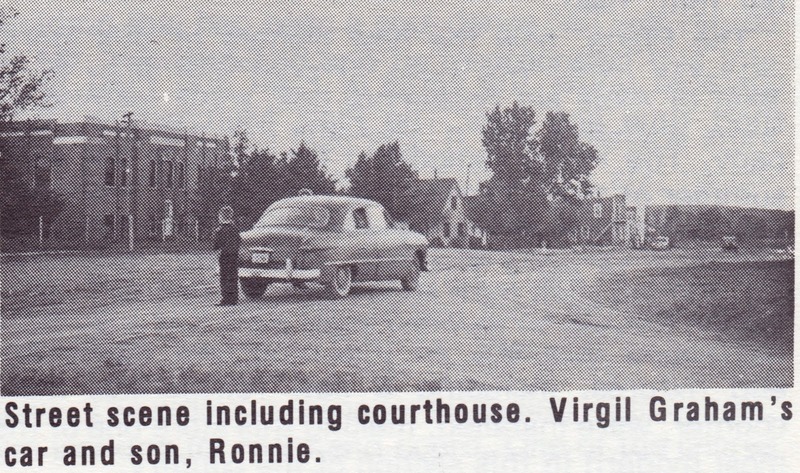 1934 was also the year that our county received its first oil-paved road. It was between Tryon and North Platte and was finished in November of that year. The thirties were tough for those who were seeking employment in this county. For that reason, beginning in 1934, some of the county’s young men went to Civilian Conservation Corps camps. There they could work and receive a small wage. At the middle of the thirties, in 1935, the ranchers received a small amount of encouragement when cattle prices rose slightly. This raise gave hope to some, but for others it was too late. 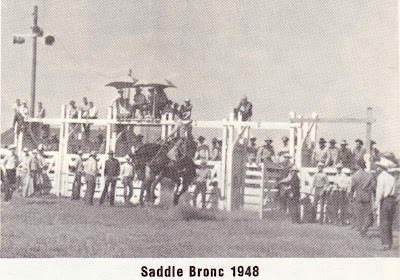 During the thirties the ranches became larger as more and more ranches were unable to make a go of it because of the depression and the drought. The Whitewater and Triangle ranches were the largest, but large amounts of land were also owned by the Bassett brothers, I.E. and B.C. Huffman, Will Dikeman, H.G. Lamb, N.E. Trego, T.J. Neal, Ida Musser and Sons, Fed Pierson, Joe McCleneghan, H.E. Ellery, J.L. Snyder, Wayne Kramer, A.B. Snyder, Jay Leaderbrand and George Van Meter. The combination of the drought and depression was undoubtedly the major cause for the changing of hands of so many businesses in 1935. Taft Haddy took over the Flats Store, Alvin Wade took over the White Rose Filling Station, Paul Bender took over the Ringgold Store, and Mrs. Burnham opened the Dew Drop Inn, all in 1935. An unusual event of the thirties occurred in 1936 when Bert Snyder discovered a buffalo in his pasture. He managed to get the animal out of his pasture and it then headed north. The animal wasn’t heard of until it was discovered that Bill Haney had found it on his place south of the Dismal River and had managed to capture it in his corral. The buffalo was then taken back to its owner, a rancher north of Sutherland. McPherson County had its first 4-H Club Fair in 1936. 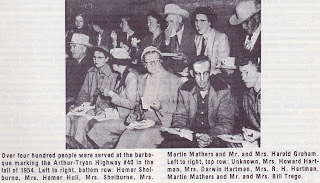 The first 4-H clubs had been started in the early thirties and had grown large enough to merit having a fair by 1936. A lack of money during the depression caused people to dream of wealth and riches. It was for this reason that, during the entire thirties, people began to believe that oil would be found in this county. In 1937 a prediction was even made that there would be oil derricks from Hyannis to North Platte. In August of 1937 Mike David modernized his store by putting in such conveniences as new counters, lighting and displays. He held an open house on August 15 which brought people from all over much of the Sandhill area. 1938 saw the close of the Tryon Bank. It had not been receiving enough support for quite some time and closed because of this. It had been operating continually since 1910 except for a five month period in 1932. As the thirties ended in 1939, a well-known and much respected citizen of this county received national recognition. Dr. Harriet McGraw had set up her practice in this county in 1919. She helped all who needed aid and traveled many miles to do this. Elma Holloway wrote a book, Unsung Heroes, in 1938 in which she told of the deeds of Dr. McGraw. It was because of this publicity that Dr. McGraw was asked to go to Washington, D.C. where she had tea with Mrs. Franklin D. Roosevelt and received various awards. 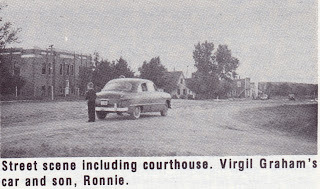 The county received its first road grading equipment in 1939. 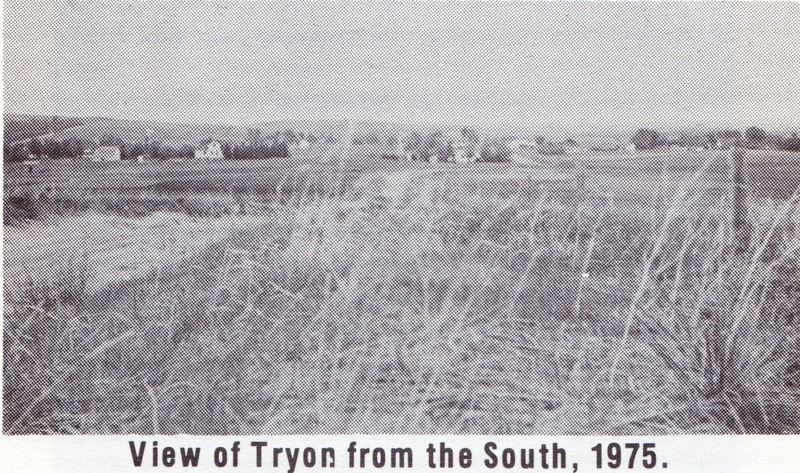 It was immediately put to use improving roads and by the fall of that year a road had been completed between Tryon and the north county line. H.C. Lamb built some cabins in Tryon in August of 1939. The Thirties were probably the most eventful years in this county since the years when it was organized. They were probably the worst years ever seen by the county due to the terrible combination of the depression and the drought. It was mainly due to this combination that 183 people left the county in the years 1930-1940. Although this was less than the number to leave in the twenties it must be realized that the people in the thirties were more deeply rooted in the county as a whole than those of the twenties. The Farm Bureau was formed in the late thirties and began gaining momentum in the forties. In 2014, the population of McPherson County is estimated to have sunk below the population of 1900. 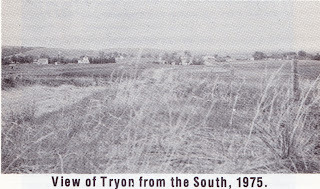 Tryon itself is now an unincorporated village with a population of 157. The red building in the center is recognizable as the David Store. David Store (now Sowders) can be seen on the left.